September 10, 2016, 8:55 a.m.
British people would opt for a summer birthday if they had any say in the matter, new research from YouGov finds. 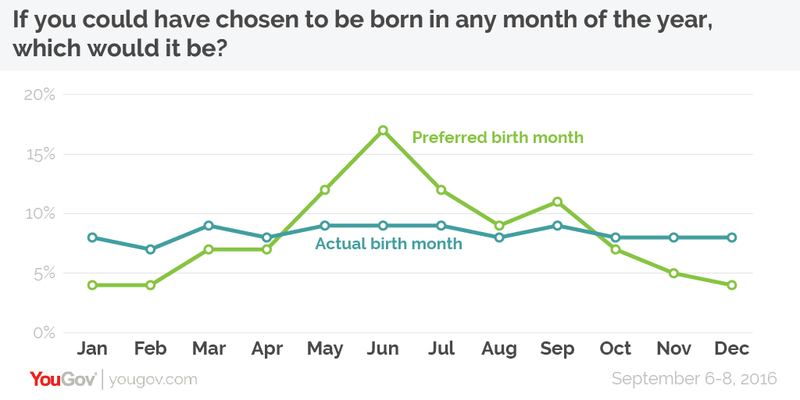 More than six in ten people (61%) would choose to have been born between May and September, with the most popular single month being June with 17%. One possibility for the popularity of the mid-year months is the better weather, allowing people to celebrate their birthday on a longer, sunnier day. In fact, this is the reason that the monarch’s official birthday is held in June; Edward VII (who was born in November) moved the official celebrations to May or June because there was less chance of poor weather during the outdoor event. Another consideration could be the distance from Christmas – indeed, just 42% of those born in December would have chosen to be so, making it the least popular birth month. Interestingly, September is only the fourth most popular month despite being perhaps the most advantageous month to be born in – being the oldest in your school year has educational and developmental benefits (as well as allowing you to be among the first in your year group to be able to start learning to drive and purchase booze). On the plus side for summer babies, they are supposed to be stronger and healthier according to the University of Cambridge. Nevertheless, the most popular birth month for every group is the one in which they were actually born – although this does did below 50% for those born in January and December. 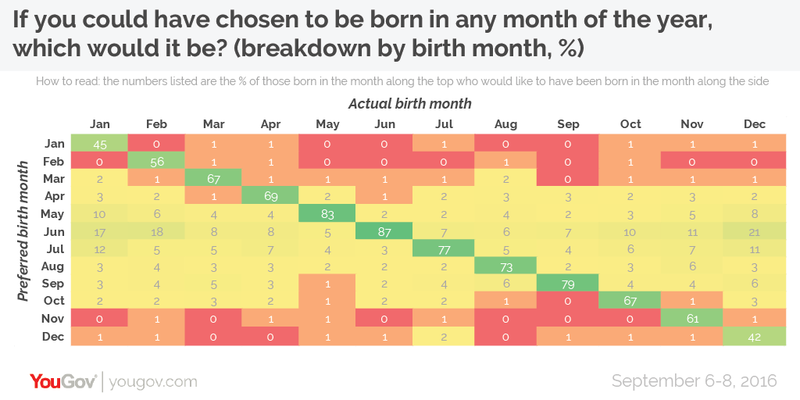 Nearly nine in ten (87%) of those born in June say that they would stick with that birth month if they had a choice.